This protocol should assist the producers of AD Digestate massively to sell their digestate, if all goes well (Steve Last - www.anaerobic-digestion.com). Anaerobic digestion technology is expected to become more attractive to investors following the publication of a long-awaited Quality Protocol aimed at cutting red tape governing solid residues from the process, known as digestate. WRAP, Defra and the Environment Agency have published a document which, subject to approval from the European Commission, will enable digestate which meets set criteria to be classified as a product rather than a waste. Such a move would mean the material would no longer be subject to waste management controls. Anaerobic digestion is the process through which biodegradable waste is broken down by micro-organisms in the absence of oxygen. This process produces biogas, which can be used to generate energy, waste water and digestate. The protocol is particularly significant because, despite government support for anaerobic digestion technology and its carbon benefits, there has been limited uptake of the technology in the UK to date - with marketing digestate one of the main sticking points. the protocol had been designed to "bring value into the resource" and one of its purposes was to create a "climate for investment". Mr Bethel added the EA was "expecting to see further investment and more AD facilities being built" thanks to the re-classification of digestate from a waste to a product. The Quality Protocol, which has been revised since an original consultation in April (see letsrecycle.com story) lays out a number of requirements for AD operators who want to produce "quality digestate" from biodegradable waste. Digestate must be produced using source-segregated materials listed in the Protocol, such as municipal food waste which has been collected separately and specified food and animal wastes. In all cases the digestate must be used in a way that does not "pose a risk to the environment" and does "not compromise the future sustainable use of the soil to which they are applied". Waste operators must also keep strict records showing showing that digestate meets the approved standards and the Quality Protocol. AD operators must also obtain certification from an approved body such as the Association for Organics Recycling. Before publication as a final document in England and Wales, the draft Quality Protocol must be notified before the European Commission's Technical Standards committee, which may take up to six months. During this period, the Environment Agency will continue to regulate the production and use of quality outputs from anaerobic digestion of source-segregated biodegradable waste in accordance with the interim regulatory position statement available on the Environment Agency website. A spokesman for Defra commented: "The Government recognises the potential of food waste to generate energy in an environmentally friendly way. For example, we are investing £10 million over the next three years into new anaerobic digestion demonstration plants to encourage a number of industries including energy providers to take up this important new technology." Farming Minister Jane Kennedy, speaking at the annual conference of the National Farmers Union in Birmingham on 18 February 2009, announced a new joint initiative with the public and private sector to make greater use of anaerobic digestion – the technology which produces energy from organic material like food waste and manure. "We're producing more organic waste in this country than we can handle, over 12 million tonnes of food waste a year – and farmers know all too well the challenges of managing manure and slurry. 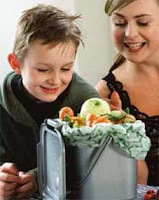 "There are alternatives to sending organic waste to landfill. Anaerobic digestion is a true solution. "This material could produce enough heat and power to run more than two million homes – helping to prevent dangerous climate change by providing a renewable energy source as well as reducing our reliance on landfill." A report, ‘Anaerobic Digestion – Shared Goals’, has been drawn up in discussion with a wide cross section of the business community including: agriculture and biogas industries, supermarkets, water and energy companies, the waste and food sectors, Regional Development Agencies, local government, and regulators. It sets out collective ambitions for the use of this technology. Ms Kennedy will also convene a new Task Group, to be chaired by Steve Lee, Chief Executive Officer of the Chartered Institution of Wastes Management (CIWM), and with members drawn from a broad range of sectors. It will lead the development of an implementation plan setting out the practical measures that Government and stakeholders will take individually and collectively to achieve these shared goals. More here, and a link to the Defra Shared Goals Report - at least it appeared to be but was not working when we tried to access it! Only two days ago, here at Anaerobic Digestion News we announced that UTS Biogastechnik is now also in UK & Ireland, but we have to admit to being slow off the mark with Biogas Nord's Press Release, below which shows their earlier UK AD Market entry which was announced last Autumn! Bielefeld, 4 November 2008. The BIOGAS NORD group has constructed its first English biogas plant in Dorset. This also marks the commissioning of the first energy crop biogas plant in the UK. The plant, with a capacity of 370 kW, operates on liquid cattle manure as well as corn and grass silage. Farmer Owen Yeatman, who is also the manager of BIOGAS NORD UK Ltd., operates the facility. "German biogas technology enjoys a good reputation in the UK. The completion of this construction project by BIOGAS NORD generated a lot of local interest. Many farmers from all over the country are coming to see the new plant. They are impressed by its sturdy construction and high efficiency. Our phones haven't stopped ringing since the BBC aired its television report,"
BIOGAS NORD AG now intends to increase its British market share. "Since numerous prospective customers from Britain had to travel to Germany in order to see biogas plants in the past, the construction of our first local reference facility will make a tremendous contribution towards future sales efforts. With currently less than 10 existing biogas plants, the English biogas market offers significant growth potential," explains Hardy Radke, sales manager at BIOGAS NORD UK. Construction of another BIOGAS NORD biogas plant with a planned capacity of 1 MW commenced in West Sussex in October 2008. This construction project in the Southern UK is slated for completion in the spring of 2009. Supply remuneration in the UK for electricity generated using biogas - among others - is regulated by a bonus system. In addition to certificates with baseline remuneration, the so-called ROCs (Renewable Obligation Certificates), variable payments for electricity supplied to the network are linked to market prices. This applies regardless of the size of the facility and the choice of substrates. Amended bonus regulations will come into force and ROC remuneration will double starting in April of 2009. "By entering the British biogas market early, we have put ourselves in a favourable starting position in this important core market,"
explains Matthias Kubat, member of the BIOGAS NORD AG executive board. "Since our flexible plant technology is not limited to the agricultural sector, we are extremely well positioned. We also offer corresponding solutions for other types of organic waste, for example in the food service industry. Thanks to the commitment of the British government to continue promoting renewable energy sources and the planned increase in supply remuneration, we are expecting significant market growth. BIOGAS NORD is ready to reap the benefits,"
Kubat adds. More here at Biogas Nord's web site. Foundation of UTS Biogas Ltd. The UTS Biogastechnik Group of companies were extended into the United Kingdom and Ireland by a new subsidiary on December 1, 2008. UTS Biogas Ltd., with Rob Heap as General Manager, is located in North Yorkshire, near Scarborough and will provide full support to biogas markets in the United Kingdom and Ireland. Rob Heap has many years of experience in the agricultural and allied industries. "It is now the right time to enter this very interesting and rapidly expanding market. Government plans to support renewable energies are well developed and already the first bills have been accepted by Parliament. It is our belief that this act will certainly help with climate change and, most importantly, will also significantly help local environments by turning waste into energy." From the German perspective they view the biogas sector in the UK as hardly developed – compared with other European markets. First developments show that mostly small – medium output plants are appealing to potential customers. UTS has over sixteen years experience in building reliable plants in this range and they believe that they have a lot to offer the UK market as they can also support the developing UK AD market as the plants in the larger megawatt ranges become important. With the full support of the parent company situated in Germany, Rob Heap and the UTS team want to offer their future customers a total-solutions concept including feasibility, planning, design & build, operating, training and complete after-sales support following hand-over of the plant. “With the vast experience, flexible approach and advanced technical standards of UTS-products, we can deliver more reliable plants and comprehensive supporting services to the UK & Irish markets than those that have been available before." The Scottish Government looks for pilot plant looking at heat use from EfW plants. The Scottish Government under its ‘Remade Scotland’ programme is going to make an award of £25,000 towards a pilot plant looking at heat use from EfW plants. Do you have a suitable plant to apply with an expression of interest? The Scottish Government have asked Caledonian Environment Centre (CEC) as part of its Remade Scotland programme to manage a tendering, evaluation and funding award project for a pilot on heat use from Energy from Waste plants (EfW). This project was suggested by the Zero Waste Think Tank for Scotland. It is expected that suitable projects will contribute to the flexible development of waste heat use from EfW plants in line with Government policy to ensure EfW systems recovery energy efficiently. There are no technology restrictions for funding although it must be for a pilot project of heat recovery and from an EfW or Waste to Energy (WtE) plant, thermal or non-thermal, including landfill gas and composting. Deliverables from the pilot will include a publicly available report from the successful applicant detailing the outcomes from the defined project criteria. Funding is only available for pilot projects based in Scotland. Remade Scotland, if you have not yet heard, is a major initiative which seeks to stimulate, develop and strengthen recyclate material markets in Scotland. Supported by the public and private sector in a unique partnership, the Remade programme - the first of its kind in the UK - was launched in 1999. The Programme has been assisting both Local Authorities and the Waste Industry for nearly 10 years providing successful, cost effective and sustainable solutions. Well aware of the importance of others players such as community groups to further develop recyclate material markets, Remade Scotland also works with and provides guidelines to several of these organisations. As part of the Scottish Government's Zero Waste Initiative, in partnership with two other delivery programmes, SWAG and WRAP, Remade Scotland has agreed a three programme of support to help Scotland achieve ambitious recycling targets. For more information Go to the Remade News section. Simon McQueen-Mason, Professor of Materials Biology at the University of York, has won a record budget to investigate how the gribble consumes wood. According to Michael McCarthy the Independent Environment Editor the little creature could hold the key to a discovery which would turn wood into sustainable motor fuel on a vast scale. If they can isolate and synthesise the enzyme the quirky named creature uses to feed on wood, the way may then be open to greatly increase production of biofuels such as ethanol can be made without using food crops. We are told that Simon came across the gribble when he was a professional fisherman on the Isle of Wight for six years before beginning his academic career. "I used to clean the bottom of other people's boats, and gribble was a major problem," he said. Now his laboratory will study gribbles collected from rotting wood by staff from the University of Portsmouth, identifying their enzymes and trying to reproduce them synthetically. The name of the gribble sounds as if it must be a purely fictional creature straight out of a children’s story or cartoon. But in fact it's a small marine creature resembling a woodlouse. The gribble spends its life boring into the planks of boats and the pillars of piers and to eat them, and its wood-consuming technique is highly successful. The gribble, is actually, the four-spot gribble, Limnoria quadripunctata, and will feature strongly in Britain's biggest-ever publicly-funded bioenergy research programme, announced last week. £27m will be spent over five years in the project which aims to create so-called "second generation" biofuels, which are much more efficient than those in production today and in a way which will be much more environmentally friendly than present biofuels, which are largely manufactured from food crops such as maize, wheat or sugar cane. These proposed second-generation fuels will be derived from non-food plant material, ideally plant waste such as straw and wood, with fast growing high calorific value willow being particularly favoured. If they can isolate the enzymes the gribble uses to extract the nutritious sugars from wood they will have made a big step on this path. Success could mean an enormous expansion of willow as a biofuel crop in Britain, on some of the three million acres of lesser quality or marginal farmland countrywide, which would go a long way to meeting Britain's targets of drawing 5 per cent of motor fuel from biological sources by 2010 and 10 per cent by 2020. Would it compete with Anaerobic Digestion? To a certain extent; Yes! However, demand for renewable fuel is likely to be so high that there will be a place for the second generation biofuels and biogas/anaerobic digestion. As ever - please give us your views by commenting on the blog site, we would be delighted to know your thoughts about this.